Readers, I had something of a kitchen disaster come miracle the other night. A last minute decision to make fudge, with a lack of ingredients, turned into a magical creation. I’d intended to make cookies and cream fudge. It didn’t quite turn out that way. This recipe doesn’t use condensed milk… handy as I didn’t have any. Then I realised I had no whole milk, but did have 250ml of single cream in the fridge… so I threw that in. 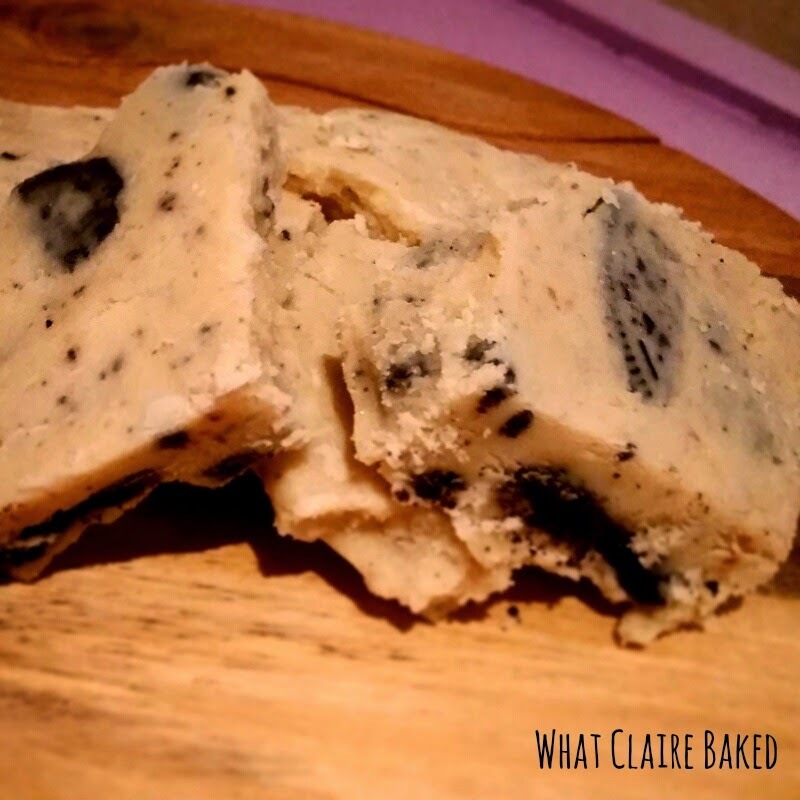 The result – a creamy, delicious, melt in the mouth fudge come tablet with crunchy bits of cookies and cream. I rescued this from the hob just in time I saw a couple of caramel flecks come through as I boiled, so quickly whipped the pan off the heat before I completely ruined it. The colour was a little darker than I thought it should be but doesn’t seem to have affected the taste. So despite not ending up with fudge, the final result is quite simply… divine. Did I mention it only uses four ingredients as well?! 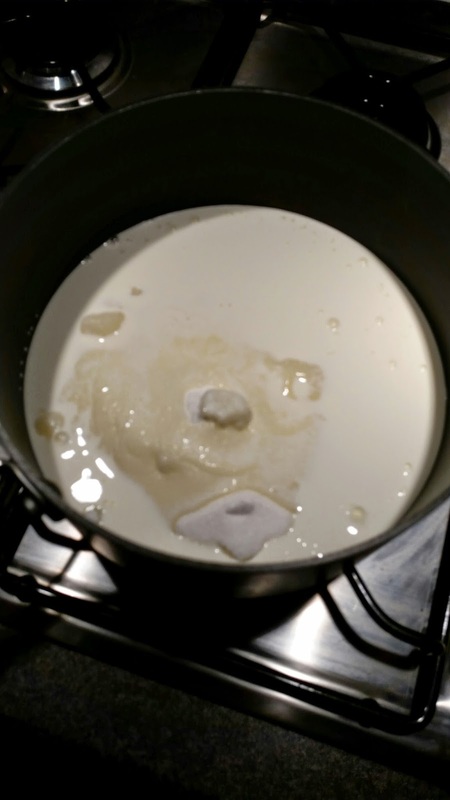 Add the sugar to a deep, heavy based saucepan and add the cream. Whisk together before putting over the heat. Fill the sink with 2in cold water. Lightly grease a small square tin. Switch the hob on (medium low) and slowly bring to the boil. 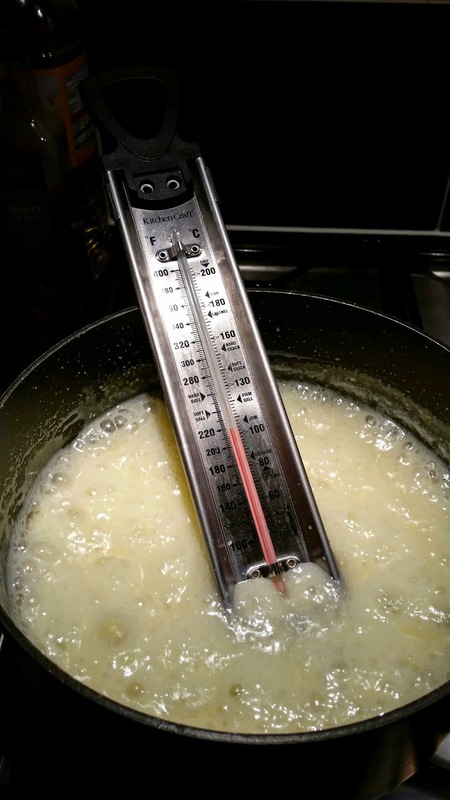 Add a sugar thermometer to the pan and boil for around 10 minutes until the ingredients reach 235F. At this point, remove immediately from the heat and stir in the butter. Once the butter has melted, put the pan into the water, being careful that the water only touches the outside of the pan. Beat the ingredients with a wooden spoon, until cool. Crush Oreo Cookies in a bag and add to the mix, stirring in with the wooden spoon. Transfer the cooling mix to the prepared tin and chill in the fridge to harden. Break into smaller pieces and serve with a good old cup of tea or coffee! Thanks Janice - it was sooo good! Looks really good! Excellent idea. Thanks - hope you get a chance to try it sometime!